The TARDIS materialises on a huge spaceship some ten million years in the future at a time when the Earth is about to plunge into the Sun. The spaceship is carrying all the world's plant, animal and human life (much of it miniaturised and in suspended animation) on a 700-year voyage to colonise the planet Refusis II. Dodo is suffering from a cold and, as the human Guardians of the ship, including the Commander (Eric Elliott), Zentos (Inigo Jackson), Mellium (Kate Newman), Manyak (Roy Spencer) and Baccu (Ian Frost), along with their servant race, the Monoids (Edmund Coulter, Frank George, Eric Blackburn), have no resistance to this ancient virus despite the efforts of their medical staff, led by Rhos (Michael Sheard), a plague breaks out. The Doctor is fortunately able to develop a cure, and he and his companions leave in the TARDIS. This seems to be the end of this particular adventure, but a surprise is in store as the TARDIS immediately rematerialises in what appears to be almost exactly the same place. 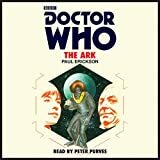 The travellers discover that they have in fact returned to the ship - which Dodo has nicknamed the Ark - at the end of its voyage. Partly as a result of the earlier plague, the Monoids (Ralph Carrigan, Edmund Coulter, Frank George, voiced by Roy Skelton and John Halstead), have now grown strong and enslaved the humans whose number includes Maharis (Terence Woodfield), Yendom (Terence Bayler), Dassuk (Brian Wright) and Venussa (Eileen Helsby). However, with the help of an invisible Refusian (voiced by Richard Beale), the Doctor is able to persuade both races to live in peace together on Refusis II.